SUNVELLA, the premier supplier of premium, refined and unrefined high oleic sunflower oils to restaurants, food services, and consumers was front and center at the Miami New Times Iron Fork 2017 Culinary Competition and Grand Tasting held at the Hyatt Regency in Brickell on Thursday night, October 5. The 10th Anniversary event was attended by thousands of Miami’s most enthusiastic food aficionados, with the three-dish elimination competition highlighting the talents of some of the best chefs in Miami. Tacology’s chef Santiago Gomez took top honors in the Chef’s Competition against Beaker & Gray’s chef Brian Nasajon, claiming the prestigious Iron Fork Award. Also, Johnson & Wales University students Brianna Long and Lyanette Vega-Matos competed for the Michael Shikany Knife of Excellence, an award and scholarship, with Long the winner. VIP restaurants offering tastings at Iron Fork 2017 included BLT Steak, BLT Prime, Mr Chow, and Glass & Vine. Other restaurants represented were180 Degrees @ the DRB, Sushi Sake, JWB Prime Steak & Seafood, Brain Freeze Nitrogen Ice Cream, Grill Argentino, Philly Grub, Dashi, Meat Market, Tacology, the Rusty Pelican, Jack’s Miami, Organic Bites, the Venue at South Beach, Amour de Miami, the Brick, Toro Toro, Soyka, Texas de Brazil, Sensory Delights, Kaori by Walter Martino, Cibo Wine Bar, Wine Date, Caja Caliente, Dr. Limon Ceviche Bar, RA Sushi, Morton’s the Steakhouse, Atlantikos, Jackson Soul Food, 320 Gastrolounge, Sushi Pubbelly, Maya’s Grill, Poke 305, Tapelia, Shake Shack, Rosa Mexicano, Yuca, Camila’s, Casablanca on the Bay, Las Ranchas Steakhouse, the Arketekt, Bagatelle, The Café at Books & Books, Campton Yard, Dezer Auto Museum, Candela, Edukosmiami, Gancho Ranch, Jackson, Lure, Philly Grub, Pinecrest bakery, RA Sushi, Rubio’s Coastal Grill, Sensory Delights, Sonesta Bayfront Hotel, Texas de Brazil, Sunny’s, and The Brick. As in past years, celebrated chef Allen Susser hosted the Chef Competition. Iron Fork 2017 judges were Chef Dustin Ward of BLT Prime; The Pubbelly Group’s Founding Partner and Chef, Jose Mendin; Chef Sean Brasel of Meat Market; and Ingrid Hoffman, professional eater and host of Top Chef Estrellas (Telemundo, NBC), Simply Delicioso (Cooking Channel) and Delicioso (Univision). Iron Fork 2017 also benefited Miami Rescue Mission with a silent auction, with proceeds going to help those in the Florida Keys hit by Hurricane Irma. The Mission also collected the unused food at the end of the evening for distribution to in-need local residents. Both SUNVELLA FryPure Refined High Oleic Sunflower Oil (frying and sautéing up to 450° F), and SunPure Unrefined High Oleic Sunflower Oil (salads fresh presentations, and baked goods) contain 83% oleic acid, promoting “good” cholesterol production in the body. A full 12 grams of monounsaturated fat are present in one tablespoon of SUNVELLA High Oleic Sunflower Oils, unlike other common culinary oils, some of which may have fats that can actually be detrimental to a person’s health. 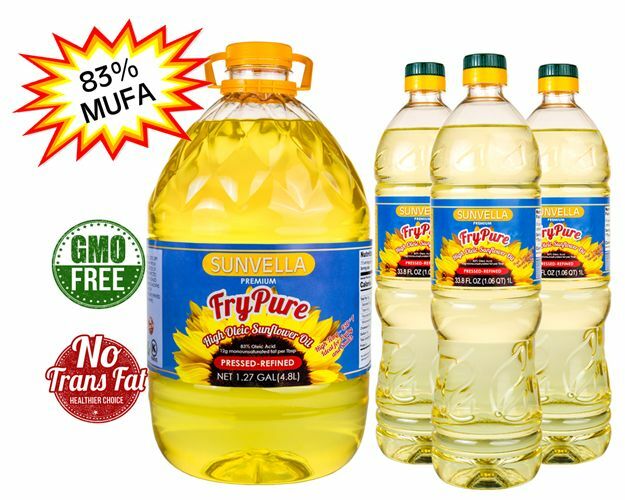 Other healthy attributes of SUNVELLA High Oleic Sunflower Oils include being all natural, fresh-pressed from non-GMO sunflower seeds, gluten-free, additive-free, cholesterol-free, Paleo-friendly, with 0% trans fat. Oil Force manufactures SUNVELLA High Oleic Sunflower Oils exclusively for distribution in partnership with one of the world’s largest sunflower oil producers. This partnership ensures a continuous supply of quality controlled, FDA approved SUNVELLA products in virtually any volume, via dependable, dedicated delivery to any outlet in the country. Since SUNVELLA products are shipped directly from the processing site, restaurants realize the lowest possible price as they provide a healthier dining experience for their clientele. For more information on SUNVELLA products visit sunvella.com.